Hammerhead Shark Limited Edition to 999- SOLD OUT! 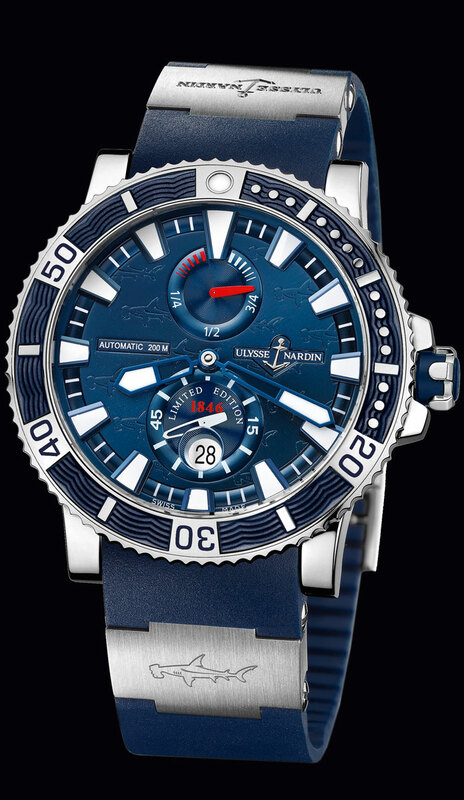 This is the Ulysse Nardin Hammerhead, Maxi Diver, Limited Edition to 999 pieces. It is a high grade 45mm, titanium case, automatic movement, with a 42 power reserve indicator. Hammerhead sharks are etched on the blue dial, and on the titanium element. The exhibition glass back reveals the blue rotor, etched with the Ulysse Nardin, name and anchor logo. It is available on a blue rubber strap, with a titanium folding buckle. CLICK ON IMAGE FOR A STUNNING VIEW!